The lads at Xbox365.com have something of a scoop: a spy shot of a Microsoft presentation discussion un-announced Xbox 360 acessories. Many of the regular accessories were announced last week, including wireless controllers and higher capacity hard drives. However, this Powerpoint slide is of particular interest as it depicts a standard Xbox 360 controller with a miniature QWERTY keyboard attached to the bottom, in gap between the left & right hand grips. It is described as &quot;for text messages and in game chat&quot;, hinting at text-based communication for the previously voice-only Xbox Live online service. Given the size of the controller, this keyboard attachment is going to be very compact - about the size of the palm of your hand. While clearly it should be easier than typing on the usual on-screen keyboard, its diminutive dimensions promises to cause headaches for anyone who has similar issues with a Blackberry or other tiny-keyboarded device. Also of note are the first details of Xbox 360 Video Camera, a direct reaction to Sony's popular Eye Toy webcam. According to a translation of the slide, the cam operates at 640x480, though at a disappointingly slow 8 frames per second: enough to see your friend's face, but far from smooth for video conferencing. Still shot resolution is vasty improved - 1.3 MegaPixels or 1280x1024 - with compares favourably with Sony's 0.3MP (640x480) Eye Toy. 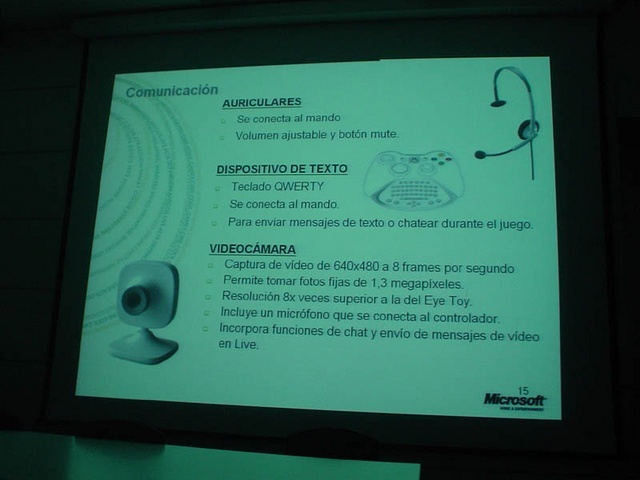 A microphone is included which connects to the controller, and the package will allow video chat and a form of video voicemail messaging via Xbox Live. Who says camera phones are a bad idea?